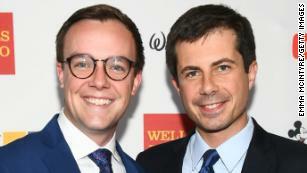 Buttigieg, the mayor of South Bend, Indiana, made the comments while speaking at the LGBTQ Victory Fund National Champagne Brunch in Washington. He reflected on his personal struggles with his sexuality, his decision to come out in 2015 and the fact that his being gay is not the result of a personal decision. During his Victory Fund speech, Buttigieg said that, while he was growing up, he wished he wasn’t gay, but his marriage to his husband, Chasten Buttigieg, has made him a better person and has brought him closer to God. The two started dating four years ago and got married last June. Pence has drawn the ire of members of the LGBTQ community in the past for his positions on various LGBTQ issues. A staunch conservative Christian, he signed the Religious Freedom Restoration Act while he was governor of Indiana. Critics of the law contend that individuals and businesses could use it to discriminate against the gay community on the basis of religion.